This is perhaps the best peach cobbler I've ever had, or made. Delicious ratio of peaches to topping (meaning lots of topping! ), and a wonderfully complex flavor due to the bourbon. It is very simple to make and works extremely well in a cast iron skillet. This recipe is by Tyler Florence from Food Network Magazine July/August 201o issue. I highly recommend making it this summer while peaches are still in season, and serving with vanilla bean ice cream. Preheat oven to 375. Prepare peaches and place slices in a large mixing bowl. Add bourbon, sugar, corn starch and cinnamon to the peaches and toss to coat. In a cast iron skillet (10+ inches) melt 1/2 stick butter, then add the peach mixture and cook until softened, about 5-10 minutes. If you don't have cast iron, it's ok to use a large nonstick skillet. Meanwhile, in a medium bowl sift flour, baking powder and salt. Slice 1 1/2 sticks of butter into small cubes and using two knives or a pastry blender, cut the butter into the flour until it is the consistency of small peas. Pour in the cream and mix just until the pastry comes together - using your hands works best. Transfer the peaches to a 2 quart baking dish, or keep it in the cast iron skillet. Drop the dough by spoonfulls on top of the warm peaches, leaving gaps is OK. Brush heavy cream on top, then sprinkle with cinnamon and sugar. Bake in the oven over a foil lined baking sheet, to catch the drips, for 40-45 minutes until the top is golden brown and crispy all over. Let cool a bit then serve warm with vanilla bean ice cream. *If you don't have bourbon (aka whiskey) on hand or prefer not to use it, then you could use some fresh lemon juice, a bit more cinnamon, some nutmeg, and vanilla extract to spice it up. Grab a big punch bowl (or a large salad bowl in my case, with high sides) and pour in the ginger ale, then mix in the juice concentrate until dissolved. Add ice then scoop in sherbert. Garnish with optional extras. Enjoy! *Everyone couldn't believe how good it tasted, and then they realized it was probably the first fruity mixed drink they'd had in a long time without alcohol mixed in. Conversely, you could probably spike this punch fairly successfully. 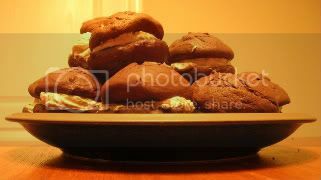 I have been on a whoopie pie spree lately, and thought I would update this post with some new found wisdom. Everyone seems to love them because they are so silly and different. I included the traditional filling option at the end of this post. This peanut butter chocolate version comes from "Martha Stewart's Cookies" book, thanks for the recommendation, Alexis! Plus, who can resist the name? These tasty treats are two chocolatey, fluffy cookies with peanut butter cream sandwiched between them. Yum. 1. Preheat oven to 400 degrees. Line two baking sheets with parchment paper. Sift together flour, cocoa, baking soda, baking powder, salt. In a separate large bowl, with an electric mixer beat butter and sugar on med speed until fluffy. Add eggs, buttermilk, and vanilla. Beat until well combined. On low speed, gradually add the dry ingredients. Mix until combined. 3. For filling, beat peanut butter and butter on high speed with an electric mixer until smooth. Reduce speed to low and add confectioners sugar. Mix until combined. Raise speed to high, and mix until fluffy and smooth, about 3 minutes. Season with salt, if desired. 4. Assemble the cookies: Spread 1 heaping Tablespoon filling on the flat side of one cookie,. Sandwich with another cookie. Repeat for all cookies. Traditionally whoopie pies have a marshmallow-y filling, and often are rolled in sprinkles for decoration. I found a recipe and tried it for a bbq, but the filling melted in the 100 degree heat. It would be great for Bay Area weather! Roll in sprinkles for a fun spin. It's been so hot here in Portland the last couple of days, the only thing that sounds good to me is sushi. No cooking! Although, I'm tempted to go out to sushi, since they would at least have air conditioning. It just isn't right for it to be over 90 degrees in your house. I never would have thought I could make my own sushi, but a friend of mine gave me a quick lesson and I've been rolling my own seaweed ever since. It's so much cheaper than going out! And it's easy. All you need is a sushi mat, nori and some tasty fillings. Since sashimi grade fish is typically a little out of my price range (and takes extra effort to acquire), I usually just make veggie sushi, which is just as good. If you do want to get fish, it actually isn't too expensive, since you only need a very small quantity to make a good number of sushi rolls. Sushi is easily made vegan, too! 1. Chop up your fillings. You want little matchstick size-slices---long and thin. 2. Set up your rolling stations. I usually let people roll their own sushi, so they can chose their own ingredients. I have two sushi mats with the rice cooker and the fillings in the middle and the small containers of water near the top of each mat. 3. Center a sheet of nori on your mat, shiny ridged side up. Scoop some rice onto the center of the nori and use a spoon to smash it flat and spread it out so that it covers the nori (to the edges!) leaving only about an inch at the top end uncovered. (This will allow the nori to stick to itself and form a roll.) About a third of the way from the bottom, press a small divot across the rice, creating a little space to nest your fillings. 4. Place a small row of the first filling all the way across the nori to the edges, leaving no gaps, but also not overlapping too much. That way each bite will have all the ingredients you add. Add your remaining toppings in a similar fashion, piling them up on top of each other in the divot area you created. The more toppings you add, the fatter your sushi rolls will be. For very spicy rolls, add chili sauce, or my personal favorite---a thin line of wasabi all the way across the nori. 5. Now for the fun part. Once you're satisfied with your fillings, it's time to roll. Pick up the bottom end of your sushi mat in both hands. Lift the mat (and therefore also the nori) up over the row of toppings and tuck it up snuggly on the side of the toppings furthest from you. You want it to be tight or your rolls will fall apart after you cut them. Using little movements, roll the mat towards the top ( so that the mat ends up more or less folding in half), while continuing to roll the nori onto itself. Stop when you get to the inch you left rice-free. 6. Spoon a small amount of water onto the empty strip of nori. This will be the "glue" that makes the nori stick to itself and will secure your roll. Finish rolling the nori up over the top strip. Look, sushi! My friend said to put the finished rolls on a plate in the freezer while you make the rest. Chilling them slightly will make them easier to cut. 7. When you are ready to eat, cut each roll into bite-sized slices.